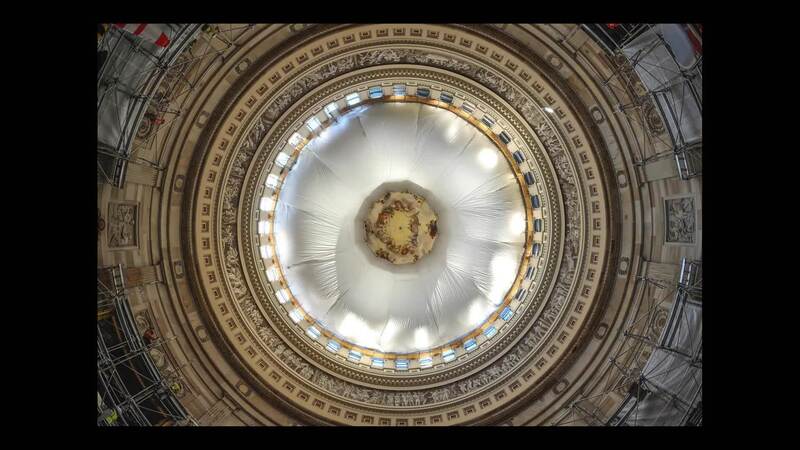 After the installation of protection for the floor and historic art, scaffold and drapery was added inside the Capitol Rotunda in support of its restoration. Next, work to remove hazardous materials (such as lead paint), restore ironwork, upgrade electrical and mechanical systems, install new lighting and repaint it to historically appropriate colors will begin. This official Architect of the Capitol photograph or video is being made available for educational, scholarly, news or personal purposes (not advertising or any other commercial use). When any of these images is used the photographic credit line should read “Architect of the Capitol.” These images may not be used in any way that would imply endorsement by the Architect of the Capitol or the United States Congress of a product, service or point of view.